R. Patrick Yeatts, MD, specializes in ophthalmic plastic and reconstructive surgery, as well as treating eye diseases, tumors and traumas in his medical practice. 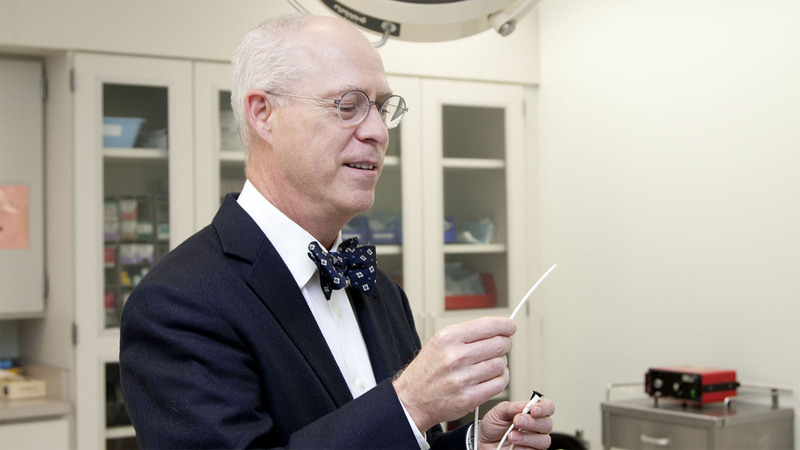 He is the inventor of a single-prong nasal cannula and consults on other medical technologies that improve patient care and safety. R. Patrick Yeatts, MD, received his medical degree from Wake Forest School of Medicine in 1978 and completed internships in internal medicine at Wake Forest Baptist Medical Center in 1979 and ophthalmology at the Mayo Clinic and Mayo Graduate School in 1982. After finishing a fellowship in ophthalmic plastic, reconstructive and orbital surgery at Massachusetts Eye and Ear Infirmary in 1983, Yeatts became an assistant professor at the Mayo Medical School and a consultant in ophthalmology at the Mayo Clinic. He practiced privately in Greenville, South Carolina from 1984 until he joined the faculty of ophthalmology and otolaryngology at Wake Forest School of Medicine in 1987. Clinically, R. Patrick Yeatts specializes in ophthalmic plastic, ophthalmic reconstructive and orbital surgery. He treats a variety of eye diseases, lacrimal disorders and orbital diseases, including Graves’ eye disease. Trained in microsurgery, Yeatts is an expert in orbital surgery, including trauma repair and treatment of periocular and orbital tumors. He also performs functional eyelid and brow surgery, as well as cosmetic surgery. Yeatts publishes extensively on many aspects of ophthalmology. He serves on the editorial board of Ophthalmic Plastic & Reconstructive Surgery and is a reviewer for many ophthalmology journals, such as Ophthalmology, JAMA Ophthalmology and American Journal of Ophthalmology. Yeatts enjoys collaboration with other experts in academic medicine. He believes that medical innovation and collaboration should, like medical practice, be patient-oriented and serve the best interest of patients. His own medical innovations are driven by patient care. By observing needs in patient care and procedures, he explores ways to improve patient evaluation and treatment by developing better medical products and procedures to meet those needs. Liking the challenges of improving existing products to make them more effective and patient-friendly, Yeatts embraces the design elements of problem-solving that lead to the creation of an improved product or result in a change of medical practice. He has previously consulted with a medical technologies firm, and his current innovation is a single-prong nasal cannula that improves the safety and effectiveness of the administration of oxygen during ophthalmic surgery. Yeatts is open to opportunities to consult with others to design products that may improve patient care and influence the standards of medical practice. The single-prong nasal cannula is uniquely designed to deliver maximum oxygen and accurately monitor carbon dioxide levels while also reducing the risk of oxygen ignition.